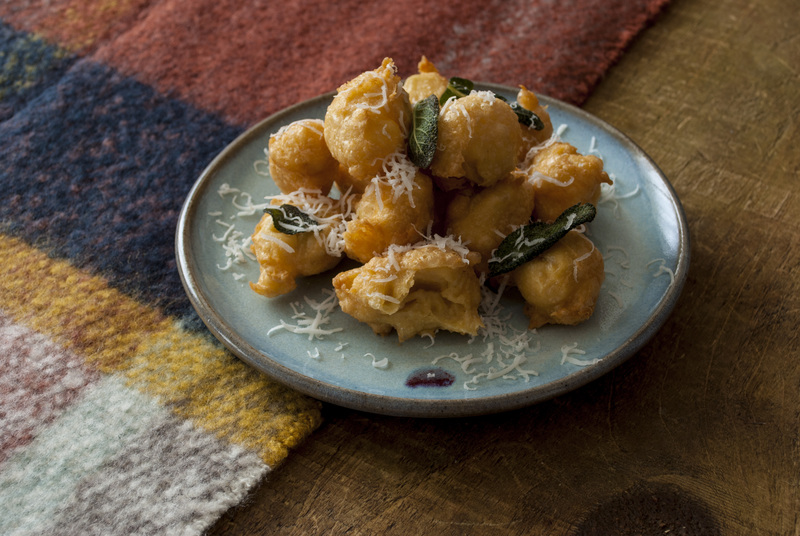 Be warned, these little puffs of pastry and cheese are incredibly moreish! I can easily devour a hefty portion in one sitting. The beignets really need to be eaten warm but as they take no time to reheat they can be made some time in advance. If you’re not keen on goat’s cheese you can substitute with cheddar, Parmesan or a firm blue cheese of your choosing. Put the butter, water and sugar into a saucepan. Bring to the boil and then add the flour, beating well with a wooden spoon until you have a smooth ball of paste that has left the sides of the saucepan clean. Remove the pan from the heat and stir in the goat’s cheese, followed by the beaten eggs, adding a little at a time. Continuously beat the mixture until you have a smooth paste, it will take a little while to come together but be patient. Season with salt and pepper and set aside. Fill a heavy-based pan one-third full with sunflower oil and place over a moderate heat, do not leave this pan unattended; the oil needs to reach a temperature of around 170°C. If you don’t have a thermometer you can test the oil is ready by dropping a small amount of the mix in to the pan. If it sizzles and floats to the top the oil is ready. Using two dessert spoons, drop ½ a spoonful of the mixture in to the hot oil. Be careful not to overload the pan otherwise the temperature of the oil will drop too quickly and the pastry will become greasy. Fry for about 3 – 4 minutes, turning the beignets over during the cook, until they are golden brown all over and have risen to the surface of the oil. Remove the beignets with a slotted spoon, drain on kitchen paper and keep warm in a low oven while you prepare the remainder. If you are making them in advance store in an air tight container once cooked – however I recommend that they are made and eaten on the same day. Heat the oven to 190°C fan, place the beignets on a baking tray and pop them in the hot oven for no longer than 2 minutes. Once re-heated pile on to a platter, drizzle with honey and finish with a grating of goats cheese. Serve immediately.